No matter how fast I get, I will always be in the middle of the pack. I might approach the upper echelons of finishers in shorter races and crack the top 1% in a few half marathons, but for all the intervals and long runs, I’m simply not willing to make the kind of changes necessary to put myself in winning shape. It would require tripling my weekly mileage, culling all remotely unhealthful foods from my diet and potentially losing the enjoyment in the process. For those reasons, I am content with being a face in the crowd, competing against himself, at his own pace. 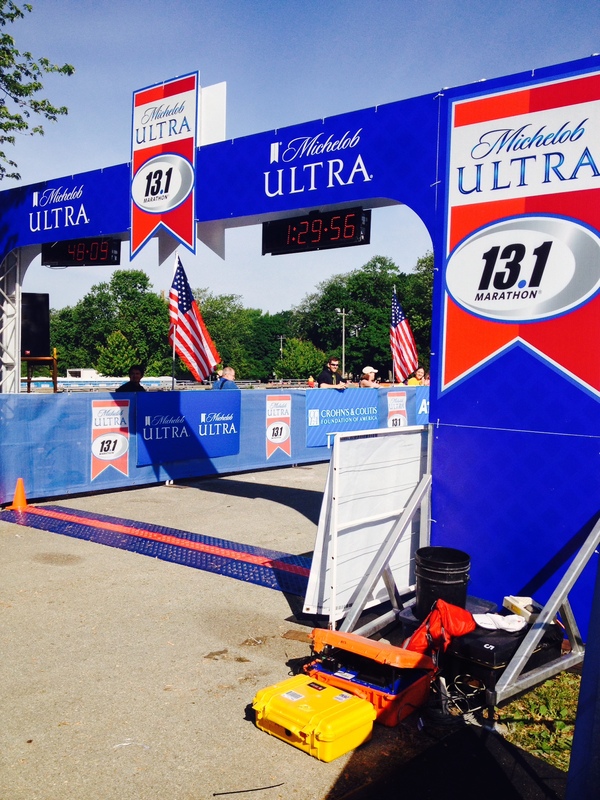 But at the 2014 13.1 Marathon Chicago, for a variety of reasons, I felt like an elite. It all started with the organization reaching out to me with an invitation to run. I superciliously imagined the bigwigs huddled around a computer, typing out a search query with their index fingers, “Who is an awesome runner great guy decent writer wants to run top search results only” and having my blog explode off the screen in a smoky, crimson blast. Their eyes would water while the war-hardened general in the back of the room slowly removed his aviator sunglasses and, with a voice aged by strife and scotch, remarked that they had found their guy. Or I was simply one of many local Chicago bloggers found by a team of interns. Regardless, I was now signed up for the second half marathon I ever ran. It was exactly five years ago to the day, June 7, 2009, and I remember my stomach being electric with nerves. Would I be able to beat my only half marathon time of 1:49:34? Could I overcome the sun and humidity to start a chain reaction of PRs? Though it wasn’t easy, I managed to improve that mark to 1:47:58 before enjoying the post-race spread of beers and pizza. Could 2014 bring back that magic? The 13.1 Marathon Chicago takes place in Chicago’s south lakefront, starting and finishing at the South Shore Cultural Center (also known as the end of the lake front path, where I log 99% of all my training miles). To get there, the organizers had arranged for a host of buses to take runners from the heart of Chicago to the South Side. One cluster of buses had gathered at Millennium Park, about twenty minutes from my condo. With a veritable fleet of yellow school buses at their disposal, there was no need to deal with a rental car, traffic or bloated public transportation. 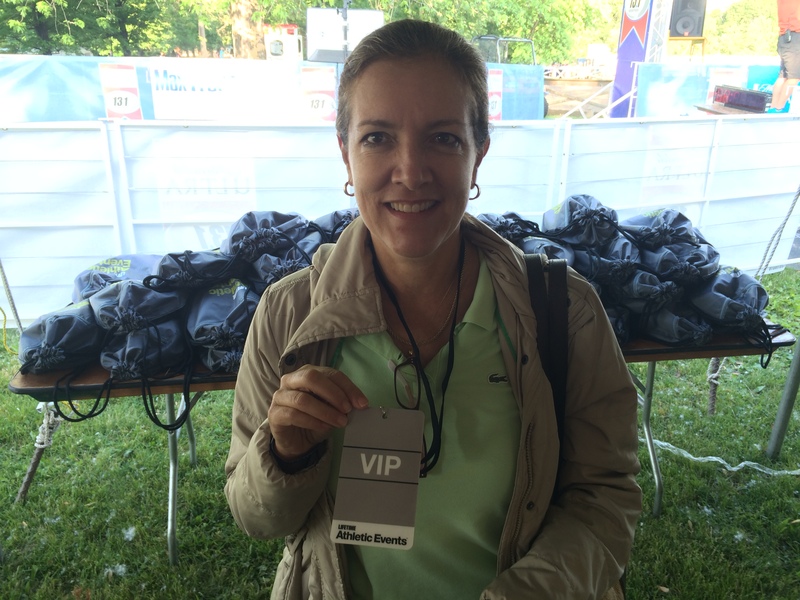 In addition to being invited to run, the organization had also set up a VIP tent next to the finish line. My mom was in town from Costa Rica, so I pulled the classic “either you let my Very Special Guest inside your Very Important Person bunker, or we don’t have a deal” gambit. Without batting an eye, the organizers at 13.1 Marathon graciously acquiesced. Of all the races to be offered such generous perks, I was ecstatic that it was the one that took place while my mom was in town. After all, if she has to hear all about these crazy races, at least she can enjoy the spectatorship beyond simply watching people run. Her review of the VIP tent was nothing but glowing. Since I had rudely awakened her at 4:15 in the morning and dragged her out on an empty stomach to watch people cross an arbitrary line on the pavement, her morning could have gone better. But while in the tent, she had some coffee, fruit and even a fresh omelet. With much help from the chefs and volunteers, I was happy to be able to pamper her. One thing I remember very fondly about the inaugural 13.1 Marathon in 2009 is that they had a very deep corral system. The majority of the race is run on Chicago’s lake front path, which is open to the public and can sometimes be very narrow if congested. Therefore the race prudently implemented from its first year a start system that included corrals A through N (it might have gone farther, but I don’t remember seeing O or P), each with a few hundred runners to ease overcrowding on the course. 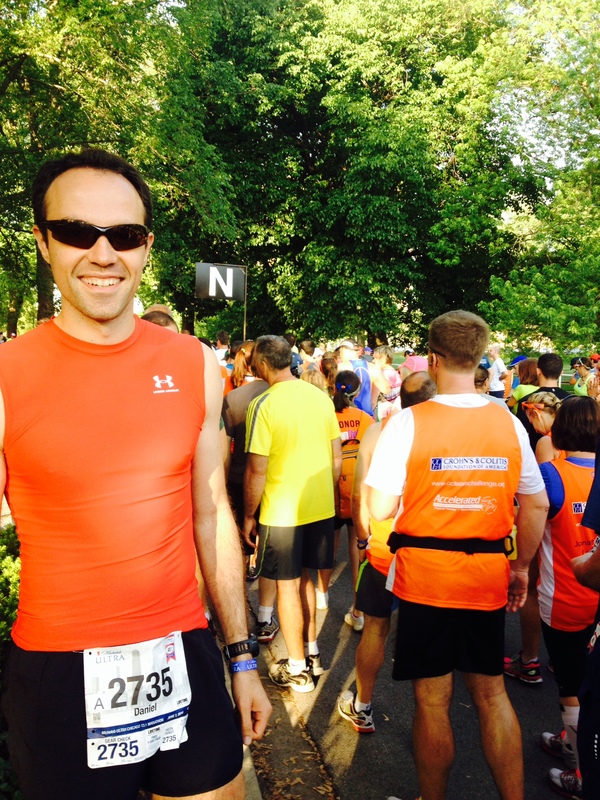 I had targeted this race as my next PR attempt, so I was awarded a spot in the A Corral. The crowd of runners spilled behind us like the queue of a popular amusement park ride, wrapping around the Cultural Center’s entrance, flanked by terra cotta columns and gardens. Between the half marathon and the 5k, we numbered almost 5,000. I was unsure of how the day’s race would go. I hadn’t done many speed runs lately except for a 5k the Saturday before where I fell 20 seconds shy of my PR. Despite the announcer raving about the gorgeous weather, I could have asked that it be about ten degrees cooler. And my half marathon PR had turned two years old in April, with few opportunities in the next six months for another shot. As things were, I wasn’t guaranteeing myself anything. I’d like to say that I tore out of the gates like California Chrome, but the narrow chute kept us from pushing the pace. 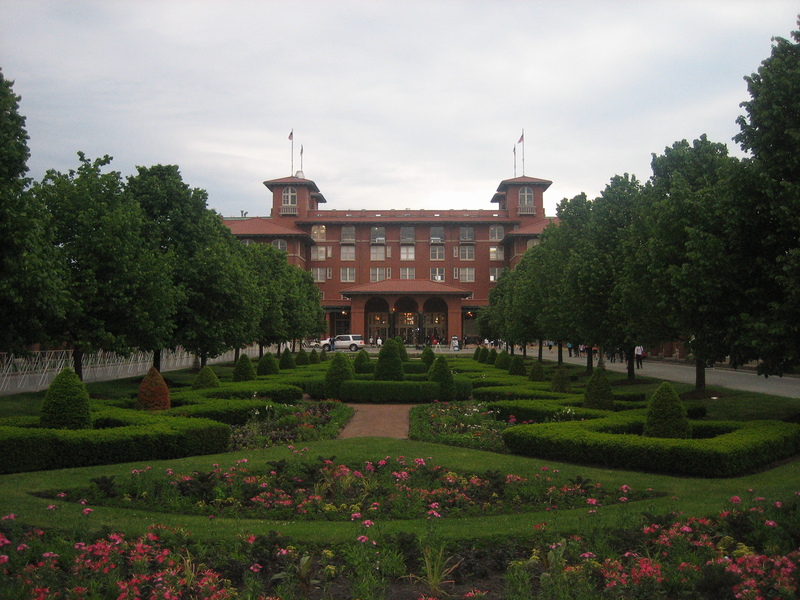 Once out of the Cultural Center grounds, we began running north toward Jackson Park, where the famous 1893 World’s Columbian Exposition was held. Today, very little of that grandiose event remains except for the Museum of Science and Industry and a small-scale replica of the gilded Statue of the Republic. It is a public park with plenty of running paths, ponds and harbors, whose ample greenery made so that much of the early miles were run in the shade. I deliberately held back the energy in that first mile, hoping to warm up to a faster pace later on. Miles 2 – 4 were run inside Jackson Park between sidewalks and dirt paths. The crowd had already thinned considerably, with large empty patches between runners. This made for an easy chase game and I loved how easy it felt. In fact, I was trying to avoid sneaking glances at my watch because I couldn’t believe what it was telling me. In an ideal world, the entire race would somehow take place in Jackson Park. Its perfect combination of paths and trees made for a beautiful run that at no point suggests you are in a bustling city. However, the race does eventually spill out to the popular lake front path, where it soars north for three miles before turning back toward the finish line. The sun was out in full force, rising over Lake Michigan to my right, not a single cloud daring to obscure it. These paths were familiar to me. They are my long run courses, my Sunday morning ritual grounds. While I enjoyed the familiarity, there was a downside to knowing exactly where I was and how far I had left to run. I tried to not let unnecessary thoughts creep into my head – I’m usually dead tired when I reach this point – and focused instead on maintaining my relentless pace. The mental jukebox was cycling through power metal songs to keep my feet turning quickly. I kept picking new runners to pass, wondering how far away the 1:30 pace group was. 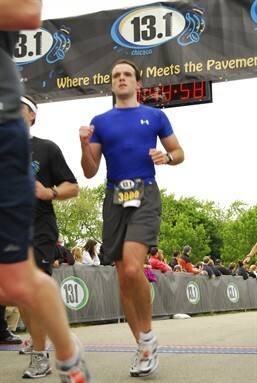 Finishing in 2009, my second half marathon ever. I realized at the turnaround that I had been running with a slight tailwind the entire time. While the breeze was welcome refreshment, it was enough to require a stronger push. Onwards I kicked. Aid stations came and went and I was pulling unusual moves – skipping some stations completely, not walking at any of them, and dousing water on my head instead of drinking it. I was hungry for this time. In recent years, my shift towards marathons has made me a little more complacent with my performance. With such a long distance, I’ve been a little more forgiving of under-performing. 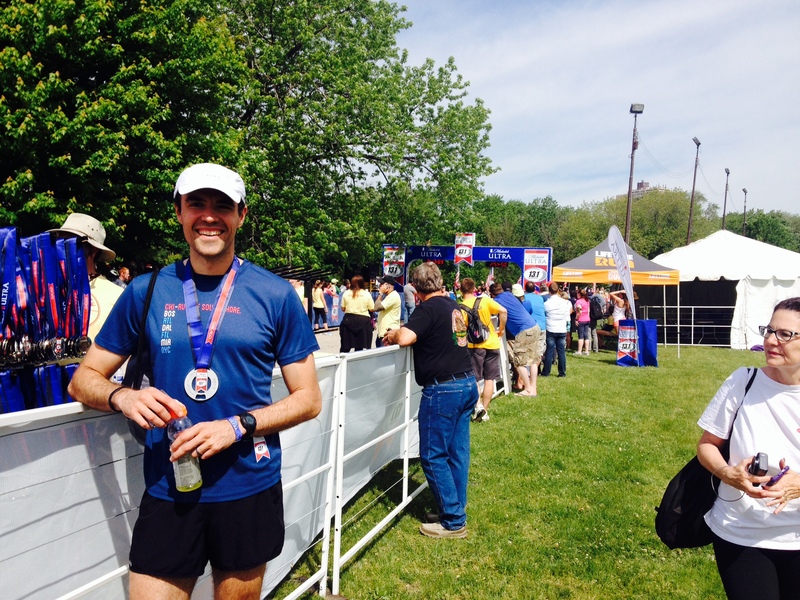 But as I snarled toward the finish line, I became reacquainted with that powerful animal instinct that seemed to consume me in those halcyon running years when almost every half marathon was a chance to push the engine to its bolt-busting limits. Perhaps this really is my favorite distance, I thought. I miss this, a lot. I ran back through the same paths, chasing the 1:30 pace group. Only on one occasion did I have to squeeze in between the runners coming toward me and a few early-morning walkers on the path. Cyclists were not terribly happy to have to defer so much path space to a large footrace, and more than one vocalized their discontent. A runner ahead of me, clad in a white bandana and green shorts, didn’t handle it so well. “On your left!” a cyclist barked and passed him. The runner then spat an expletive to his back and vigorously picked up the pace. There was no way he could have caught the cyclist, but he still shot out ahead of me with an ax to grind. iPhone shutter speed made so that my mom captured my shadow about to finish. I kept my pace, conceding a few seconds per mile as the race continued. The sun was still out and the pace was starting to hurt. I felt less like a train moving powerfully and smoothly and more like I was dragging a rickshaw cart. Even so, I passed the runner with the white bandana and surged forward. A few miles from the finish, as we ran practically on the beach, the adrenaline that had been pumping through my chest and stomach suddenly felt a little thick, as if it were about to rise up and shoot out of my mouth. Time slowed and I was overcome with fear, annoyance and resignation. Was it finally going to happen? After so many races, was this the one where I’d literally leave it all out on the field? But the moment passed. My stomach regained itself and I kept pounding the pavement towards the end. There was just one more road to navigate before the sharp turn into the finisher’s chute. A shirtless runner passed me, the only one besides the angry runner with the white bandana to do so since the first mile marker. He was cruising confidently so I didn’t give chase. But just then, as I ran under the red, shingled gate of the South Shore Cultural Center, White Bandana passed me. Not wanting to concede another place, I picked it up and for the third time in the race, left him behind me. I looked at my watch and realized that the long-elusive goal was almost mine. The course reached the beach and I made the final turn, my eyes darting immediately to the digital clock above the finish line. I began celebrating, my arms springing into the air as I crossed the timing mats in 1:29:42, my first time ever under one hour and thirty minutes, my scream rising above the music and the announcer. Once back in the VIP tent, I enjoyed a few celebratory beverages with my mom while sweat unceremoniously dripped off my shorts and soaked into the grass. My elation was not lost on her. Though she may not have understood every detail I rattled out about my performance, she knew I had done something special. I ran at a pace that would normally reduce me to a sputtered lurch by the fourth mile, yet somehow today it had felt easy for ten of them. Had I been holding back all these months? Was I capable of much faster? What if the weather had been ten degrees cooler and the course boasted fewer turns? But I knew I wouldn’t have another shot at a speedy half marathon for a while, so I simply enjoyed my new accomplishment. This PR had not only broken through a psychological barrier, but renewed my interest in the half marathon and stoked the fires of confidence. There’s something about breaking new ground that can jolt you into dreaming the impossible. Just how far into the 1:20s can I go now? I want to thank the organizers of the 13.1 Marathon Chicago for inviting me to run their race, treating me like an elite athlete in the process. In addition to being a top-notch event, it was a day steeped in nostalgia and a chance to demonstrate how far I’ve come as a runner. And now, it’s time to slow down. That’s the thing, I don’t think I’ve put in “hard work” over the last few months … except for the races. I don’t really consider racing to be “hard work” because they’re the payoff! There’s definitely an effect, but I feel like I’ve been slacking in the training department and putting too much faith in my race performances, hoping they’ll keep me in fighting shape. But hey, I shouldn’t be complaining right? Sub 1:30 – KaBOOM!!! Well done on pushing until the end (and putting white bandana guy in his place), and what a fantastic race to do it at. Did you get personalized post-race massage? Embroidered towels and a private shower? What else comes with the ‘Elite Package’? While they DID have free massages, they were made available to everyone, not just the super high-rollers like myself. I didn’t receive any towels, but they did give me a bathrobe with my name bedazzled in multi-colored jewels (false), a suckling pig roasted in a mango glaze (patently untrue) and a private helicopter ride back to my condo (a bald-faced lie). It’s good to be king. Great recap, I was with you every step of the way! I think Halfs are my favorite distance also. A marathon is like an expedition. A 5K is just a warm up and a 10K is just a long run, well not really. My friends call a Half a “civilized race”. You can run for two hours or less, hang out and have a few beers and be home before the day is over. I completely agree — half marathons are long enough to warrant feeling a sense of accomplishment and pride, but not so long that they wreck you for the rest of the day. I think I’ll stick to more local halves and keep the marathon for traveling. I could get used to that right? Congrats on the PR!! That is a fantastic time! Love the medal! Thanks! It’s heavy and a subtle bottle opener too. Get OUT! 1:29:42 on a hot day? Call it home-court advantage, call it Mom-inspired motivation, but I’d say you found your happ(iest) place on Saturday. Because some days, for those of us firmly esconced in the middle of the pack, elite is more than anything a state of mind. And just in case I didn’t have enough pent-up motivation once this foot heals, sub-90 is going to be one tough nut to crack. I have to admit (since only you and I read these comments, right?) when I first saw your picture of Mama Solera, my immediate impression was that she was a college friend who you’d met for lunch after the race. And an independent source (ok, it was Katie) guessed “30s” as her age. Very sporting of her to rise and shine with you at 4:15am… I still remember my Mom and sister not-so-politely refusing my invitation to join me when I ran the 2010 Inaugural Dallas Rock ‘n’ Roll Half Marathon. 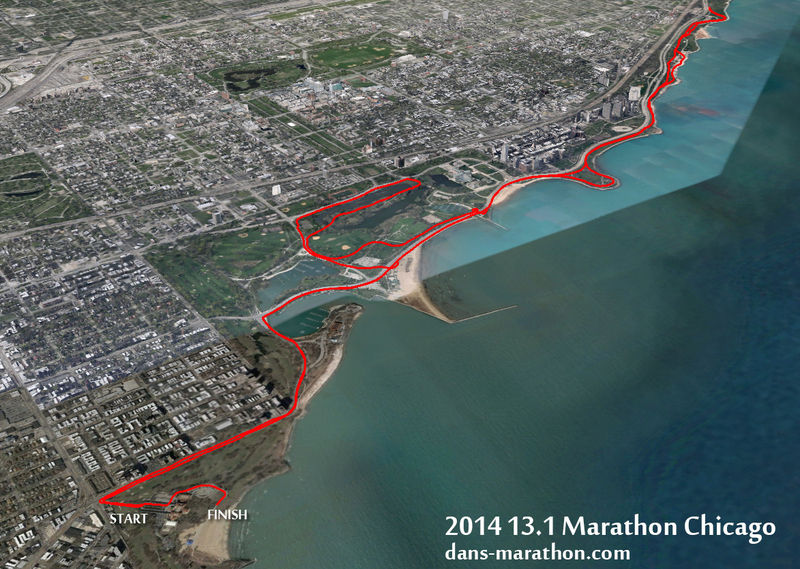 Great job Dan, and thanks to the folks at 13.1 Marathon Chicago for giving you the chance to live and tell this story. 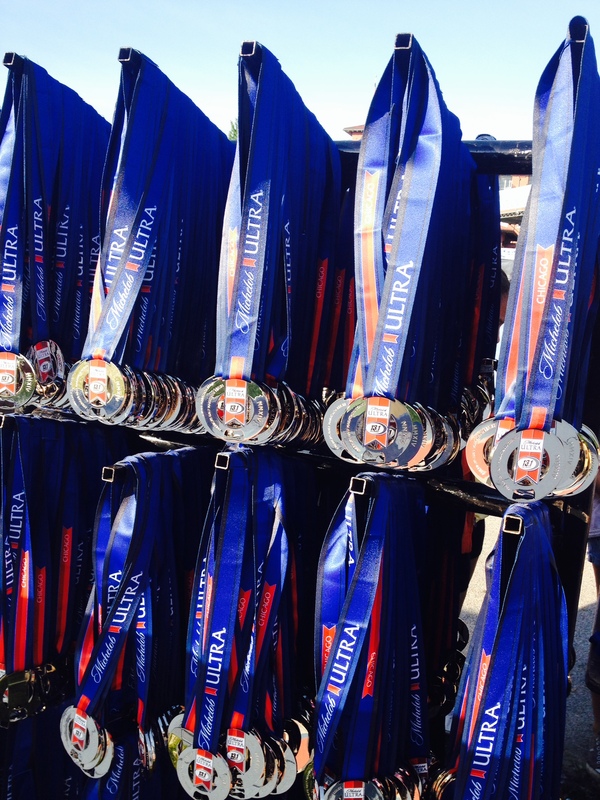 My only hesitation would be the “Michelob Ultra” logo blasted in full color across the center of the medal… that’s fine (and colorful!) on the ribbon, but I’d recommend a bit more restraint on the medal itself. Now then, since one good question deserves another… just how far into the 1:20s CAN you go? And my mom certainly appreciates the flattery — I hope the same genes that keep me running light on my feet will also keep me looking as young as she does. Fingers crossed there. As for how far into the 1:20s, that’ll depend on whether I even sign up for another competitive half marathon in the next six months. I have one in October, but that’s going to be another 39.3 double-state weekend. It’ll have to be next winter or spring, but it’ll happen. This race lit that fire once again. Here’s to hoping dips in half times will translate to bold new PRs at the full distance. WOW!!! I think because you don’t detail your training on the blog, I’m always under the assumption that you just show up and magically run fast times whenever the mood strikes. Even so, my jaw dropped when I saw your half time, because magic running abilities or not, you are undeniably a fast person now. This has also shattered my dreams of being as fast as you because a 6:50 average half just isn’t going to happen for me anytime soon. And how cool that you got to share that with your mom (whom I imagine you don’t get to see very often) on your home turf with a race that has personal significance. It was meant to be! Congratulations! Among the many thoughtful comments you mention here – which is a staple of your contributions that I very much appreciate – it’s reflective (and perhaps pathetic) of me that I fixated most on your correct use of “whom.” I can be the worst. Though I will say that part of this performance did feel magical. Aside from my crazy May, I didn’t really do anything different training-wise leading up to this race. I did a few speed runs, but no more than usual, I didn’t do any new leg exercises or tread new ground with certain drills … so I really did kill it out of nowhere. Maybe just keeping fitness is enough to improve sometimes? YES! I got the chills reading this, especially at the end. I know that special celebratory scream at the finish line happens very sparingly for guys like us. Glad you got to experience it on your home turf, with all the pomp and circumstance you could get. Way to go, Dan! Don’t we know it — it’s so fun when you start running and you have a very high chance of landing a PR at each new race. And then you get competitive and diminishing returns become the name of the game. So yeah, it’s all about taking advantage of great conditions and circumstances when they all come together. Other than that, we just have to go out there and do our best. Isn’t that what the sport teaches us? Thanks for the support Jeff.